And with one big gulp of milk, it was over. Well not entirely but for the most part my paleo experiment is over. Since the last update until two days ago there had been no more slip ups, but there had been tantrums and interesting skin developments. The tantrums usually involved dessert and usually occurred when Nutella was being consumed next to me on the couch. At one point Seb seemed very amused and perplexed as he watched me stomping around the kitchen fighting with myself about having (or not having as the case was) dessert. Ok, so maybe this zero sugar thing was harder than I was letting on. Unfortunately the skin thing was a bit less controllable than tantrums. Over the last week and a bit I started getting very dry, scaly and red patches all over my face. No matter what quantity of moisturising cream was applied, it was getting worse. I am not one to ‘internet diagnose’ but after reading a bit I did discover that large quantities of raw egg whites and eggs in general can be quite troublesome for some people. I was having a raw egg every day in my smoothies, plus cooked eggs for lunches on the weekends. Lots of eggs. Then there was the calcium. The little worry in the back of my mind kept telling me that I was not meeting my calcium needs. Maybe I was, but I wasn’t going to get out a calculator and work it out. And so, with that big glass of milk on Thursday night, things began to slip-slide away. Milk smoothy (sans egg) for breakfast, two cappuccinos at morning tea, creamy potato bake and birthday cake for Seb’s dad’s birthday. Dairy is back on the menu! But looking forward, I will definitely limit (as much as possible) to good dairy such as milk and cottage cheese, with less salty fetta and fatty cheddar. And that brings me to the last item on the paleo diet: grains. I have not noticed a big difference to my gut in the last three and a bit weeks. Much to Seb’s displeasure, more farting, yes, but that is for sure a result of the increased amounts of dried fruits. What I am going to attempt is to go gluten-free for a while but allow grains like corn, rice, buckwheat, and quinoa. I want to give it a good month to see what the benefits are, but I’ll spare you the details and won’t be posting about it unless miracles happen. Protein and natural fats from things like avocados and coconut keep you full and energised for long periods of time. Increasing lean protein to once every meal is amazing for recovery. Sugar is bad. Cut it out for three weeks then try to go back: I guarantee things taste different and artificial. Cutting out all grains is very hard. Hard to easily meet carb requirements, hard to prepare alternate meals, hard to eat anything outside of home besides a salad or meal you prepare yourself. 85% dark chocolate and oven dried whole bananas and the yummiest treats ever. Oh yeah, and chocolate coconut butter. It is even better than Nutella. Coconut Chocolate Butter – Raw Organic – AMAZING! Thanks to all for the encouragement, especially to those who attempted dairy, sugar and grain free concoctions when I was around. It has been interesting and educational, but it’s not for me. Going back to my original paleo-skeptical post I mentioned “I have always stuck by the philosophy that pretty much everything is fine in moderation”. Nearly a month later and I still fully support that statement. This entry was posted in BikingBethany and tagged nutrition, Paleo on August 4, 2012 by bethany. Halfway paleo but definitely not a cave woman! Now maybe I have cheated the system a bit and allowed myself fruit and palm sugar, but have stuck to no refined sugar and definitely no foods with added sugar. Did you know that dried craisins are 40% sugar?? Well I sadly discovered this after learning to read labels more carefully… this was after my ‘stocking up the cupboards with healthy snacks’ Costco trip! Bugger! But really, this part has probably been the easiest change for me. I am not a real sweet tooth and have often been known to get the ‘sugar sweats’ when eating sickly sweet food. No cheese, no butter, no yoghurt…. all good. But milk is HARD (big sad face). No skim, no soy, no nothing! After a failed attempt to drink an espresso without milk (picture coffee dripping down my computer monitor after I spurted it out in disgust), I have easily adapted to all kinds of tea. Peppermint to freshen me up in the morning; earl grey for lunch; and a chamomile before home time. Good stuff. Breakfast, however, is a different story. I have desperately been experimenting with breakfast options and settling on green smoothies has resulted in copious cans of coconut milk. But knowing that a can of coconut milk has about 200% of your daily saturated fat intake, I am starting to feel guilty about these delicious breakfast concoctions. How much ‘good fat’ is too much fat? The internet has very conflicting responses to this question and I am still undecided as to what I believe. I am on the look-out for some almond milk, apparently this is much lower in fat. This part of the paleo experiment is going OK. Now I will fully confess I am not sticking to the paleo-diet’ in the strictest of forms. If you are, you are not meant to eat anything stachy including potatoes, yams, sweet potatoes and even fresh corn. I am all up for giving things a go, but my poor athletic body training 20 hours a week needs some energy from somewhere people! Hence I have allowed all of the fore mentioned starchy foods. After a big day I have been adding potato mash to dinner, and it helps to fill the carb-less void. The hardest part for me has been breakfast. Going from a massive bowl of oats and milk to choosing from proteins and vegetables kinda narrows your options and does not fit so well into a working / sporting lifestyle. Oats + milk = speedy. Poached eggs + pan warmed veggies = sloooow. So I have replaced the breakfast oats with a combination of smoothies (egg, coconut milk, spinach and banana) and cooked stuff on days where I have more time (poached eggs, spinach, mushies, tomato). I have noticed two very good things already, in only two weeks. I feel full all the time. Protein and fats in the morning keeps me going way past lunch time. There have been no morning tea cravings and much less up-and-down hunger protests from my tummy. Now I walk past the biscuit barrel and straight to the fridge for some ham or turkey breast. Sounds weird hey! I am recovering very well. We have put in some very big weeks lately, including a 360km round trip on the mountain bikes to Broulee, and I seem to be feeling much stronger the days immediately after compared to pre-paleo Beth. Again, I attribute this to the awesomeness that is protein. I have been good, but I haven’t gone crazy strict and I know where to draw the line. I attempted to ride 360km on all natural paleo food and took some hard boiled eggs, potatoes, nuts, fruit and even oven dried bananas. Unfortunately my eggs got smushed and on day 2 I thought I would prefer a Hammer Bar (all organic with no added sugar anyway) over food poisoning. I also chowed down on some potato chips, fries and a few sips of coke at the top of the Major’s Creek climb. Then that night I ate the biggest, fattiest, milky chocolate pudding for dessert and it was great. Life goes on! I have lost a couple of kg’s already, down to 68kg, so that is a plus too 🙂 I have not seen evidence of miracle skin or amazing sleep. My gut has been feeling OK, but I wouldn’t say that it is by any means fixed. So for those of you who are slightly curious, I will give a final run down in 2 weeks. Maybe I will have turned primal by then? This is what cave women looked like, right? This entry was posted in BikingBethany and tagged nutrition, Paleo on July 26, 2012 by bethany. Now stick with me here, I’ve already had a few people grunt in disgust and laugh at my supposed ‘caveman desires’ when I have mentioned the paleo diet. Believe me when I say that I am not one for fads, and most definitely not one for fad diets. I have always stuck by the philosophy that pretty much everything is fine in moderation. I would consider myself to be pretty healthy in that I do weights twice a week, yoga twice a week, train between 10 and 20 hours a week on the bike, always have a rest day each week, love vegetables and meat, my whole life is basically Dry-July and I would happily say that I eat well. When it comes to food, I am not one of ‘those’ cyclists. The one that uses riding around the lake as an all clear for eating packets of chips, pizzas, mountains of chocolate, protein shakes, buckets of pasta and for always stopping at bakeries to wash down sweet pastries with numerous coffees. Don’t get me wrong, I love that stuff, sometimes. There have always been a few things that just don’t sit right with me though. Ever since a trip to South America in 2008, my insides have never been the same. 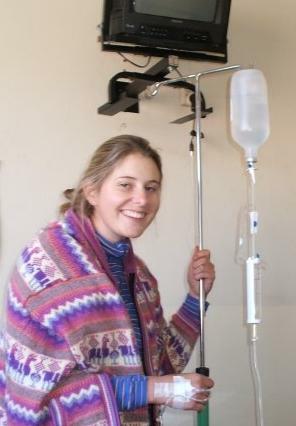 Let’s just say that in the space of four weeks I had three bouts of salmonella poisoning, a bladder infection, acute bronchitis and giardia and was ordered to go home to Australia by a very nice doctor in Cusco, Peru. After coming back from that holiday (a.k.a trip from hell) I have suffered from terrible gut trouble leading me to see my GP, a holistic medicine doctor and even a naturopath who rubbed my tummy and gave me weird herbal drops to take. No relief. After four years things have settled down but I still find that anything wheat related, anything dairy or overly spicy will give me grief. After reading recently about the benefits of a paleo diet, I realised I had no idea what paleo meant and started investigating. What it means is that you cut out dairy, grains, legumes and sugar; processed stuff that paleolithic humans didn’t have. At first I scoffed at the thought of it. What on earth would I eat to fuel my body then? Cause lettuce and fish sure wasn’t gonna cut it at an eight hour enduro! It turns out that a lot of athletes eat in a ‘paleo way’ to stay lean but have excellent recovery resulting from all the protein. The options are huge in terms of the foods that are ‘left’ (as Seb calls them). Protein can be from all kinds of meat and eggs, plus you can eat all vegetables, fruit most and nuts. With boasts of higher energy levels, better skin, better sleep, faster recovery, getting more lean and most importantly having a healthier gut, what have I got to lose? I’m not going to rant and rave about the positives and negatives about why I should or shouldn’t. It is not like I am attempting Morgan Spurlock’s ‘Supersize Me’ or anything horrendous, this is good wholesome natural food we are talking about here! So without further ado, I have filled the fridge to capacity with a plethora of veggies, the fruit bowl has turned into a ‘fruit table’, the freezer is full to the brim of fish and other meats, I’m stocked with nuts, almond meal, dried fruits, coconut milk and the tea cupboard looks like the tea section in Coles. Current weight is 70kg, current sleep quality is about 70% good and these days my gut is about 50% happy I reckon. Goodbye coffee, chocolate and pasta, hello healthy gut. Pressing the reset button now, I’ll update at halfway. 15 days and counting! 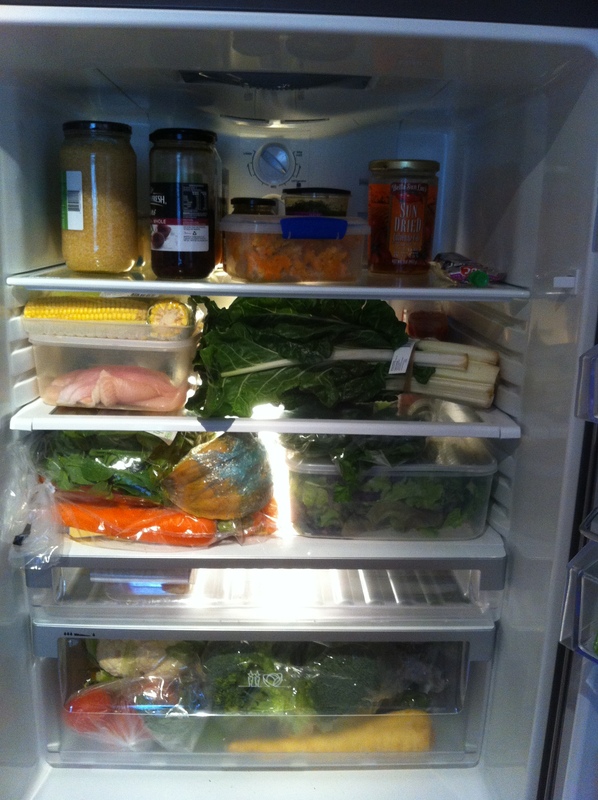 A fridge bursting with freshness! This entry was posted in BikingBethany and tagged nutrition, Paleo on July 9, 2012 by bethany.